Where do you get your style inspiration? After you’re inspired by an outfit, have you ever tried to recreate it? 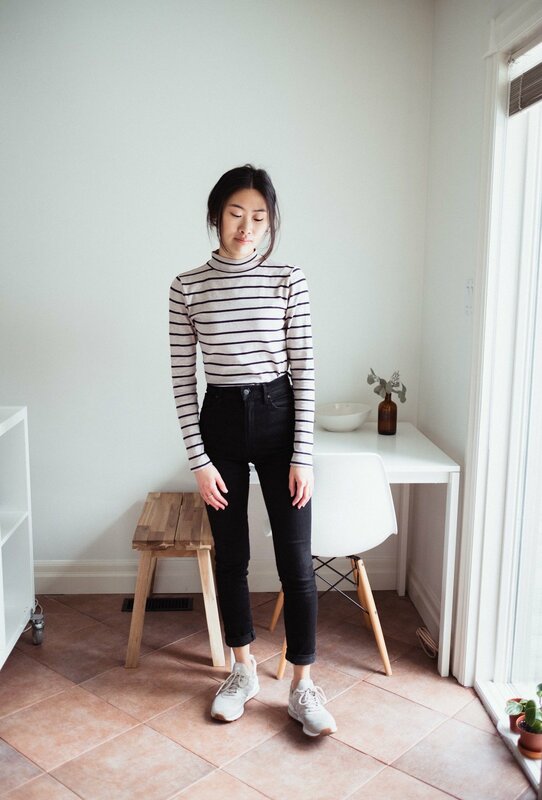 I thought it would be fun this week to try a little experiment and recreate some of favourite Pinterest looks from my Fall Capsule inspiration board. I like to do this from time to time to get my creative juices flowing and use what’s in my wardrobe. As I like to promote here and on Instagram, having a sustainable wardrobe isn’t only about owning sustainable and ethical pieces. It’s about being content and using what you already have, and when you find gaps in your wardrobe or find that you want to purchase something, that’s when I would slowly curate ethical and sustainable pieces into my wardrobe. I’m all for a wardrobe filled with intentional, quality purchases, and that’s why I choose to support and partner with sustainable brands sparking change in the world, but I also believe the most sustainable thing to do is to use what you have. I like to explore different and creative ways to get the most out of my existing wardrobe. Last week I shared all about styling denim for the workplace. If you haven’t seen that post yet, hop on over there for some more creative styling tips! 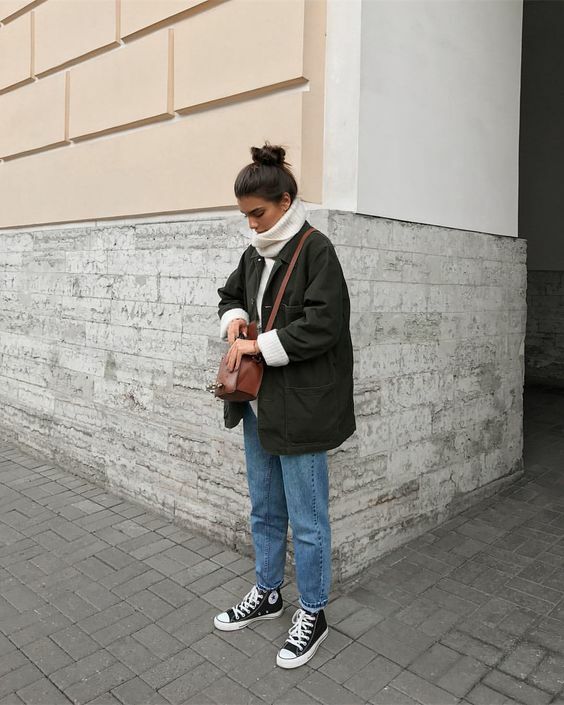 Let’s get into the Pinterest recreations and maybe renew some pieces in your wardrobe! The first step is to curate your own mood board of your favourite looks if you don’t already have a board. After you’ve done that, take some time to go through your visual board and pick out the looks that you love and think you could recreate with pieces you already own. Follow the general idea of the outfit, whether that be with the style of shirt or pant, following the colour idea of an outfit (i.e. monochromatic, all pastels, all black), etc. Below I’ve recreated 5 outfits from my Pinterest board. Let me know how you think I did in the comments below! Disclaimer: I’ve tried my best to find the source of the inspiration photos, some of them I couldn’t find, but if you own or know the owner of the photo, please reach out and let me know so I can give proper credit. Here I’ve taken a simple layering technique from my Pinterest photo inspiration. I love that this look is also suitable for the office, minus the commuter rain boots! This is an example of an outfit where I had extremely similar pieces in my wardrobe and could quickly put this one together. I definitely don’t wear a top knot as elegantly as the girl in this photo but, I loved her outfit and was inspired to put my own twist on it with the pieces I had. The shirt I’m wearing is stolen from my husband’s wardrobe though! This was probably the easiest, no-brainer outfit inspired by this Everlane pant ad. With this outfit I tried to match the colour palette and style of the pieces. I wore a draw string style pant similar to the photo and wore a top and cardigan that matches the style and colour of the inspiration photo. I hope this styling post has sparked some creativity and given you some Pinspiration! Please let me know if you’ll be trying any of these outfits or giving this tip a try with your own inspiration photos. I’d love to see what you come up with.